Today, on All Saints Day, let me start at the end of the day. The Anglican Church of Korea hosted a dinner for our Anglican confessional group at the Novotel. There were about 160 Anglicans present, plus some of our hosts. I proposed a toast to our beloved Anglican Communion and to Archbishop Justin and Caroline Welby. A delightful evening with good company and delicious food on the occasion of the 123rd year of the founding of this diocese, as Archbishop Paul Kim of Korea pointed out. The dinner reminded us that nothing replaces face-to-face encounters with other Anglicans, for through these we appreciate each other more and consequently grow in love for God and one another, for this is communion. The dinner was preceded by a service celebrating All Saints Day, and Archbishop Justin preached a sermon reminding us of the gift and responsibility we have as Anglicans to care for one another even as we value our differences. In a plenary session in the auditorium, Archbishop Justin had also addressed the WCC assembly, again drawing on our Anglican heritage and highlighting the enormous privilege and also responsibility of defining our identity within the broader ecumenical framework. In another WCC plenary dedicated to Asia, drama and speeches drew our attention to the life, witness, worship and near-martyrdom of the church in this continent. This was very moving, drawing us into their story and how they perceived their position as a persecuted minority which faced near-extinction in certain places. There were also redemptive stories, especially one related by a missionary doctor who told of his experience of two parents at first rejecting a pair of Siamese twins, but then – when one died after an operation to separate them – reclaiming the surviving twin. Again, we were challenged by the difficulty most communities have in dealing with difference and disability. Today, I also had an opportunity to connect with Presiding Bishop Ziphozihle Siwa of the Methodist Church of Southern Africa at the assembly's health machine vendor, where as we measured our blood pressure we chuckled at how ecumenical work raised it. I also had some time with Bishop Jo of Pretoria, just connecting at a personal and informal level. Bishop Jo and I are together in the “Just Peace” conversation group. Today we were running behind schedule at this session, and there was less input by speakers and more rushed conversation. But it was still very useful since although we went off initially at a tangent, we finally got stuck into discussing the real definitional and conceptual issues of what a just peace is all about, as well as strategies for praxis. The business plenary was tense and rigorous, which reflected our reality and was to be expected, especially after one of the speakers raised issues of marriage and sexuality and posited his theological view as the correct one. There is a growing conservatism – and I say this without advocating moral relativism – which can lead to the trashing of God-given freedom and rational thought, as well as of the celebration of diversity. Of course there should be limits to everything, such as we found in our ecumenical conversation, where we were starting to explore a call to close down a nuclear power plant, mindful of the fact that we are only a few kilometres from one in South Korea. As most of you know by now, for me communications and accountability are key. Today I spent time with the Episcopal News Service in the person of Matthew Davies, as well as with WCC communications people, exploring further ways in which I and our province can communicate more effectively. We recorded an AIDS day message as well as one about our perception and understanding of ecumenism. Tomorrow, we have excursions around the area where we are meeting and, God willing, we will go to the port and ecological areas preserved around Busan. It is our daughter's birthday today, so I want to end this on the personal and send her “hugs and kisses,” as she would normally say when she is in a good mood. May God our parent who looks after us all shower her and all parishes named All Saints with blessings. We are all saints if we do the will of God who sent us. 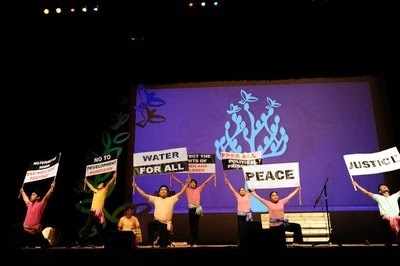 PHOTO: A performance at the WCC assembly features Asian concerns, acknowledging struggles of churches seeking justice and peace.